Did You know, with a paint brush in hand and a cluster of vivid dreams in mind, it is possible that your heart beats the color of Art? If you think you have the power to do just that, read through the rules and clickety click that registration button. 1. Two participants per group can take part. 2. Participants should report to the venue 15 minutes prior the events starts. 4. Paint brushes to be brought by participants themselves. 5. Time limit of one hour will be allotted to each participant to complete their work. 6. Use of cell phones is strictly prohibited. 2. The participants should report to the venue 15 minutes prior the event starts. 3. 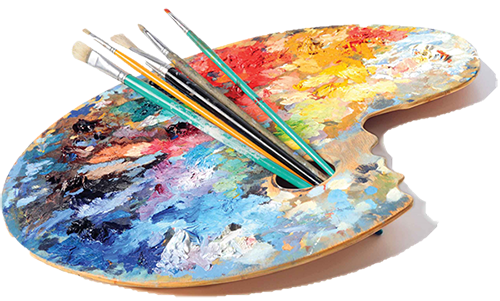 The participants are required to bring their own acrylic colours and paint brushes. 4. Time limit allotted is one and half hours. 5. Use of cell phones is strictly prohibited. 6. Canvas boards shall be provided by us. 1. Two participants per group are allowed. 2. The participants should report to the venue 15 minutes prior the events starts. 4. No readymade materials can be used. 5. Use of cell phone is strictly prohibited. 6. Time limit of one hour will be allotted to the participants to complete their work. 1. Three participants per group are allowed. 3. Materials will be provided and participants are not allowed to bring any additional materials. 4. Use of cell phones is strictly prohibited.